There are only about 150 Amsterdam albatrosses remaining in the world. 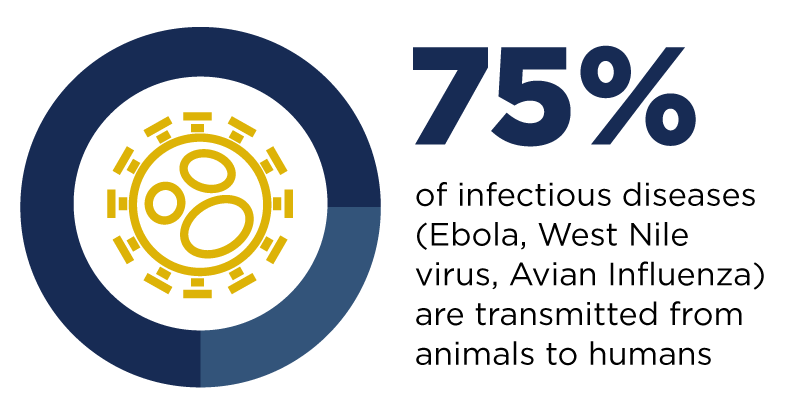 The species is critically endangered, and its biggest threat to survival — avian cholera — was likely inadvertently introduced by poultry brought to a French Navy station at the albatrosses’ only breeding site. Avian cholera, a disease well known for killing thousands of waterfowl in the U.S., has been increasingly hammering wild bird populations worldwide, even in the most remote and isolated locations. Amsterdam Island, the only place where its namesake albatross breeds, is just a freckle in the Indian Ocean. It’s also where the Yellow-nosed and Sooty albatross species breed and, like the Amsterdam, may face extinction from recurring avian cholera outbreaks. Dr. Marcela Uhart, who leads the Latin America Program at the UC Davis Karen C. Drayer Wildlife Health Center (WHC), recently led a study that summarizes current knowledge on diseases affecting this iconic group of seabirds and the implications for their conservation. Albatrosses can spend nearly their entire lives at sea. 7 albatross species are critically endangered according to IUCN, an authority on species status. There's more information and ways to support seabird research and conservation on the Latin America Program website. In the publication, Uhart and her colleagues Luciana Gallo and Flavio Quintana from the National Research Council of Argentina found 53 studies on albatross health going as far back as the 1940s. It quickly became obvious, however, that there are numerous gaps in species and geographical coverage in those reports. This is most likely due to how hard it is for scientists to get their hands on these birds. Not only do albatrosses breed in very remote and isolated sites, they are also well known for their ability to spend nearly their entire lives at sea, traversing the world’s oceans. Coincidentally, more than half of health studies performed to date focus on two relatively abundant and easy-to-access species, the Black-Browed Albatross and the Southern Giant Petrel. Worryingly, however, there are virtually no health studies for the seven albatross species listed as critically endangered by the International Union for Conservation of Nature and Natural Resources (IUCN). Though significant efforts are underway to improve fishing practices and reduce incidental catch or “by-catch” of birds and non-target fish species, hundreds of thousands of albatrosses and other seabirds are entangled and drowned in fisheries operations. This means that a lot of life and a wealth of information are meaninglessly wasted. In a collaboration that supports the fisheries’ mitigation efforts and the scientists’ need for information on today’s albatrosses, the WHC Latin America Program has been working with the Agreement on the Conservation of Albatrosses and Petrels and Birdlife International's Albatross Task Force. Over the past two years, together they have trained personnel who are posted on fishing vessels in several South American countries. These "on-board observers" monitor fishing by-catch and are now recovering dead birds that would otherwise be thrown overboard. Like the mythical phoenix, Uhart's group expects to bring these birds back to life by using them to enhance the quality and diversity of information available today on the elusive albatross species. Studying accidentally drowned birds can help build knowledge on the birds' distribution, genetics, demography, health, stress, feeding habits and much more. This project is not only of great relevance for the conservation of albatross and petrel species, our iconic ocean wanderers, but it also emphasizes the value of collaborative efforts and underlines ethical considerations for critical work with endangered wildlife.